I am spending a month in Verona (Italy, not New Jersey) with a group of students from Fitchburg State College. While here, I will be teaching a course called "Food: The Mediterranean Connection." I am a cultural historian who does food as a sideline and a food historian who does cultural history. Take your pick. Anyway, my plan for this course is to explore the various cultural sources for the foodways of the Mediterranean in general and Italy specifically. We will look at the history of food in the region, as well as the history of specific types of food (olive oil, pasta, gelato, pizza, and much more). I have developed a set of readings for the students, but much of our work will be exploring this beautiful city, looking for and at food. We arrived on Friday and have been walking around Verona, following our intrepid guide Rala and learning about the history of the place and its people. And yes, tasting tasting tasting. We introduced the students to the pleasures of gelato, especially Gianduja. We also went to PAM, the local supermercado, to shop for provisions. What a treat! I bought some freshly made radicchio ravioli, a piece of perfectly ripe gorganzola, asparagus, eggs, and garlic. Oh yes, some local wine, C'a del Plin Barbera d'Alba. The impact of Carlo Petrini and the Slow Food movement is even more noticable since I was last here in 2003. The selections, even in a large chain supermarket, are varied, local, fresh, and delicious. Of course, there is still the same old mass-produced agrobiz stuff, but now consumers have a choice to go local (or at least regional). A wonderful trend, for us and for the earth. 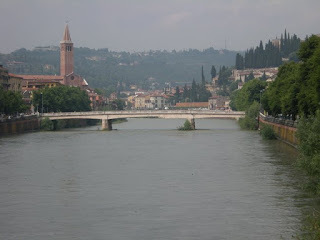 I will be posting here on a regular basis throughout my month in Verona, as will my students. Hope you enjoy traveling with us (in the slow lane).